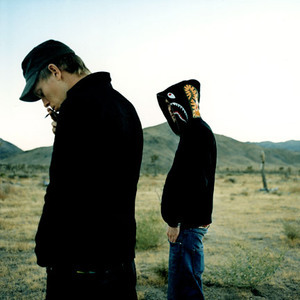 UNKLE, a musical outfit founded in 1994 in London, England, United Kingdom. Originally categorized as trip-hop, the group once included producer DJ Shadow and has employed a variety of guest artists and producers. From the sleeve notes for the latest release End Titles...Stories For Film released in July 2008, the current line-up is stated as James Lavelle and Pablo Clements, also a member of the Psychonauts. From the sleeve notes for the latest release End Titles...Stories For Film released in July 2008, the current line-up is stated as James Lavelle and Pablo Clements, also a member of the Psychonauts. The original line-up was James Lavelle, Tim Goldsworthy (now a member of DFA) and Kudo (Major Force West, Skylab). This incarnation released several EPs and singles, usually involving collaborations with other Mo'Wax affiliated artists. In 1998, after the departure of Goldsworthy and Kudo, Lavelle enlisted US producer DJ Shadow to help complete UNKLE's debut album, "Psyence Fiction". On this album they collaborated with a variety of guest artists including Thom Yorke (Radiohead), Mike D (Beastie Boys), Badly Drawn Boy and Richard Ashcroft (The Verve). The album contained songs which merged indie-rock with hip hop. In 2003 UNKLE released "Never, Never, Land". At this time UNKLE consisted of Lavelle and new collaborator Richard File, and the album also featured Ian Brown (The Stone Roses), Josh Homme (Queens of the Stone Age), Robert Del Naja (Massive Attack), Mani (The Stone Roses, Primal Scream) and others. A third album entitled "War Stories" was released in July 2007. It features collaborations with Josh Homme (Queens of the Stone Age), Ian Astbury (The Cult), Autolux, Robert Del Naja (Massive Attack), The Duke Spirit, and Gavin Clark, and is far more strongly rock-influenced than previous releases. The album was preceded by an EP, Nights Temper, of which a limited pressing was released in May 2007. Lavelle has also released several mix albums and remixes under his own name and under the name Unklesounds (together with Richard File). UNKLE is known for remixing music from artists such as Explosions in the Sky, Massive Attack, and Oasis.